You have probably noticed that we’ve become pretty avid bloggers here at GigMasters. We certainly have a great time doing it but we’re not writing just for the fun of it. We’re blogging to drive quality traffic, build new relationships and, yes, get you more gigs. There is a method to our madness! Our Inside the Gig blog is, of course, for you, our members. This blog covers a lot of ground, from new feature announcements to membership tips and general advice on getting gigs and furthering your entertainment career. Plus it’s a great place for you to interact with us and your fellow members (don’t be shy – we love your comments)! In addition we run two other blogs: Life of the Party and the Wedding blog. These two are designed to inspire and inform people planning events (a.k.a. clients and prospective clients). Life of the Party covers everything from kids’ parties to seasonal events like the Fourth of July and Cinco de Mayo - all big traffic drivers by the way. The Wedding blog, not surprisingly, is all about weddings. And, as you probably know, the wedding market is huge and those wedding gigs can pay very, very well. Contrary to what you might think, these blogs aren’t all about SEO. These blogs are about sharing GigMasters’ expertise and opinions on all things entertainment while building an audience along the way. 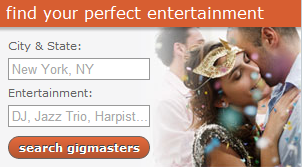 Our blogs are read by entertainers, regular folks planning parties and professionals working in the wedding and events industries – exactly the people we want visiting GigMasters and sharing the love for our service. 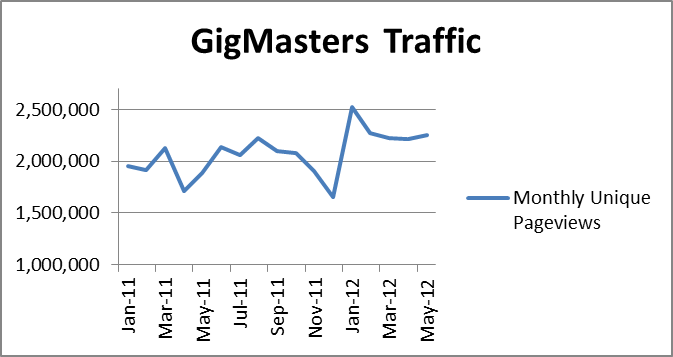 First let’s look at how GigMasters traffic has been doing over the last year and half or so. The above chart shows GigMasters monthly unique pageviews since January 2011 (each unique pageview represents all of the visits a single user makes to one page. So even if you visit your Profile 15 times in one day, that’s only one unique pageview). 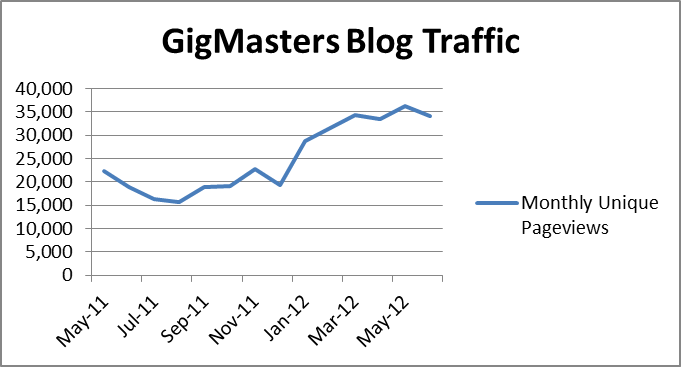 One more thing to note: January 2012 marked an all-time high for GigMasters traffic with over 2.5 million unique pageviews. The most visited pages in January 2012 were search results pages, Control Panels, our homepage and the gig request success page. We love seeing traffic to that success page - each hit means another gig request was just submitted. So, while we’re talking about the importance of blogging and the effect it’s had on traffic, it’s great to see that our most key pages are still the ones receiving the bulk of the traffic. Blog traffic reached its peak in May of this year with 36,318 unique pageviews. We first broke the 30,000 mark back in February (and just missed it in January). Blog traffic has been on the rise for a while now but it took off in early 2012. That’s when our blogging efforts really started paying off – the momentum and relationships we had been building with our blogs started to translate into traffic. 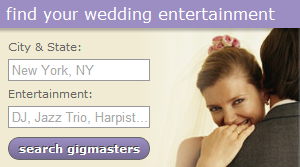 If you’ve spent time on Life of the Party or the Wedding blog, you may have noticed we’ve installed a truncated version of the GigMasters ‘Entertainment Search’ box. It’s proven to be a particularly useful tool as we’ve had thousands of gig requests come in this way. In addition, we spend a lot of time on Life of the Party and the Wedding Blog talking up our members. We believe that live entertainment really is the life of the party and that we have entertainers and vendors for every event. And we’re definitely not shy about it! It's just another way to shine a light on our amazing entertainers and our diverse entertainment offerings. So, to recap: engaging, helpful blog content = more traffic. But not just any traffic, quality traffic - potential clients who are motivated to find and hire great entertainment and who are already familiar with GigMasters. Do you blog? Are you an Inside the Gig fan? Ever check out our other blogs? Let us know what you think about our blog strategy by leaving a comment below.